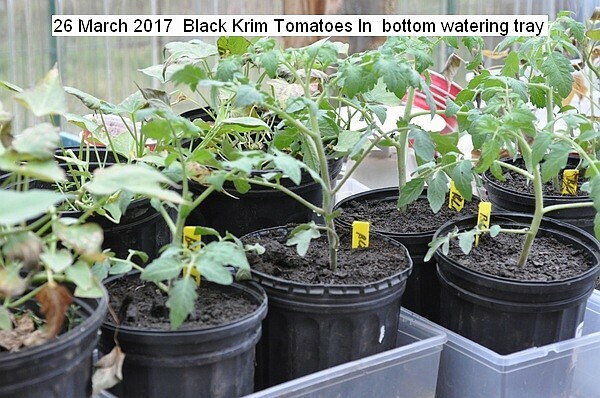 Five pots of black Krim tomato seeds were started. 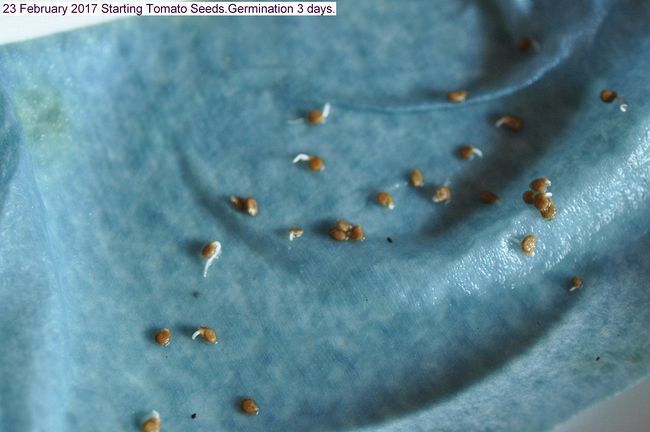 Last year seed was placed between two sheets of paper towel to confirm viability. Some innovations this year. Five pots are placed in a 23 liter bucket with a fan and a LED light. For now it is an experimental set-up. Main purpose is to see if large stem plants can be obtained. After the plants are established they will be accommodated in the greenhouse utilizing Sunlight. 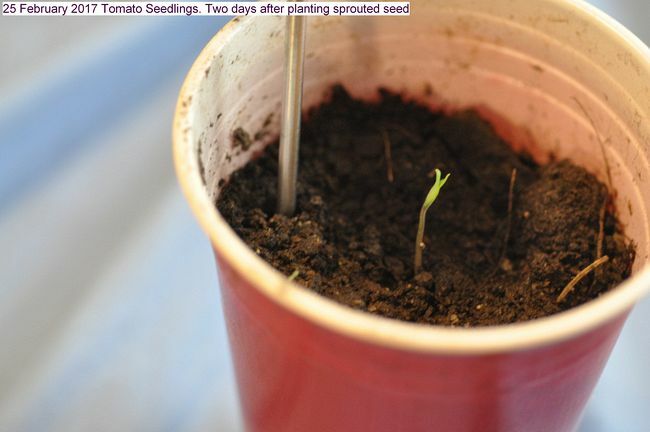 Two days after planting sprouted seed they have grown. The light used is a LED, 18 watt consumption, (90Watt equivalent) bright white,1500 lumens from Home Depot. Fan for moving air. Temperature is about 28C. Seven days growth. The lighting system is a success. The plants are strong an not leggy. 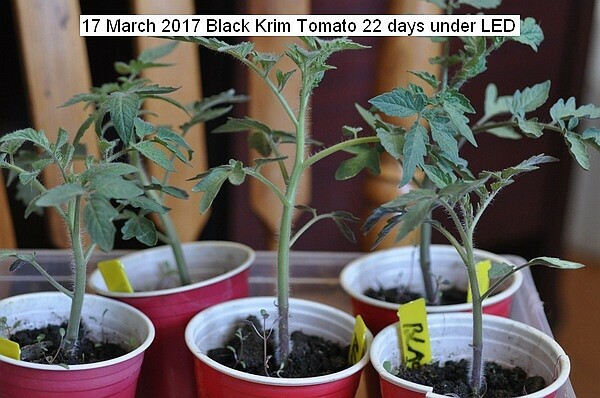 Five Black Krim growing under LED lamp, nine days from planting. The plants are not leggy and appear strong. They are watered from the bottom about every four or five days. 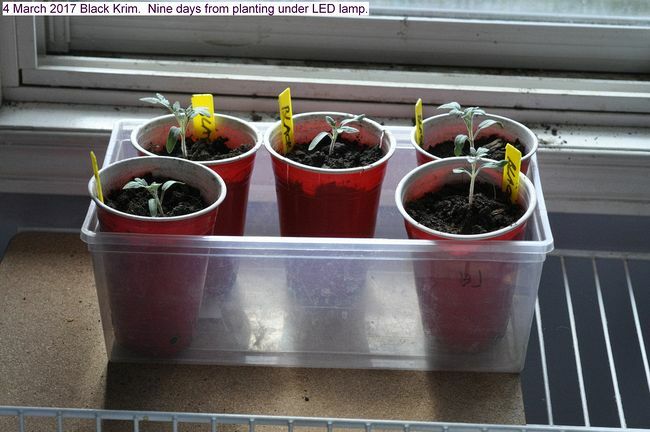 Black Krim tomatoes grown under LED lamp in a pail thirteen days from planting. A fan is used for some air movement. The plants are exceptionally strong and healthy. Twenty two days under LED lamp. Very successful seed start. Growth from germination after 30 days indicating the efficiency of relatively cheap LED lamps from the local hardware store.These lamps are cool running and should revolutionize home growing under lights. 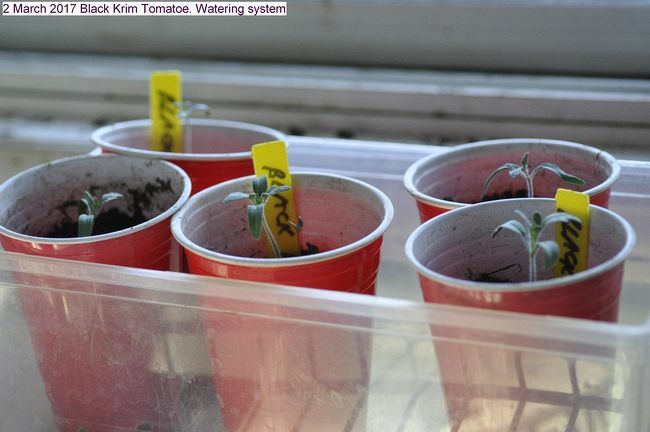 The cup pots were getting too small for the Black Krim tomato plant roots, so were moved to larger pots. The pots were placed in containers to facilitate bottom watering. Plants will be kept in the greenhouse until ready for outdoor planting about 25 of May. They are on a heating pad, since the greenhouse is inadequately heated if temperature falls much below freezing. 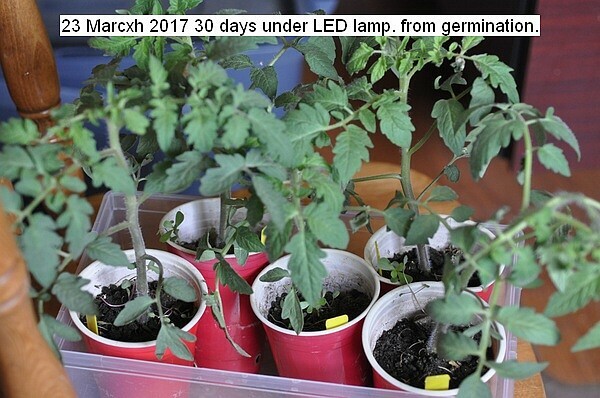 This entry was posted in Uncategorized and tagged 23 February 2017 Starting Tomato Seeds, 25 February 2017 Tomato Seedlings, Starting Tomato Seeds (Black Krim), Tomatoes under LED lamp. Bookmark the permalink.